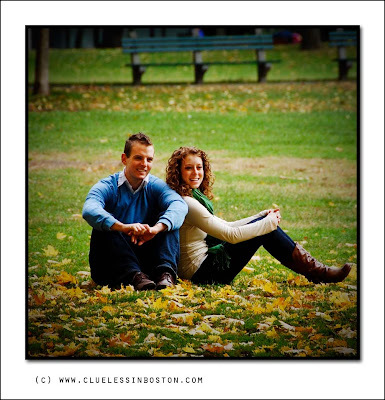 Portrait of a young couple on the Boston Common. I caught them being photographed by another photographer and I took advantage of the opportunity and took a few shots myself. Below you can see the other photographer taking her pictures. Isn't it subject to prior consent? They look so happy. I wonder where they are in their relationship. That's a trick I have used myself a few times; got a couple of nice ones on Tines Square NY doing that. How lovely to see two happy smiling faces. I wonder whether it was 'an occasion' that they were having their photo taken to commemorate - surely not just models? I like the way you seem to have vignetted the corners to focus attention on the couple. I just found your blog through a suggestion from Google. 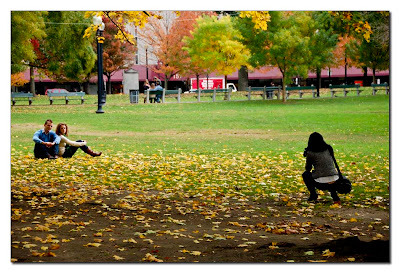 I took a photo last spring in the Boston Commons of people being photographed by another photographer. perfect capture. they are so good looking and I like the woman photographer too.